At least once a year, the Asian elephants living in southern Bangladesh migrate eastwards, passing through the forest that straddles the border with Myanmar. Between 35 and 45 elephants are trapped in Bangladesh, unable to follow their usual migratory route into Myanmar – around 15 percent of Bangladesh’s entire elephant population, according to the IUCN. As a result, elephants are still trying to follow their usual migratory route through the refugee camp – often with dire consequences. Since September 2017, 14 Rohingya have been killed by elephants. Others have been injured. Finding a way to allow the elephants to pass through while preventing further casualties has proven challenging. IUCN and UNHCR, the UN agency for refugees, say a corridor between three and four kilometres wide would need to be carved out through the camp, requiring at least 24,000 shelters be moved. Even if the corridor’s location was altered to avoid such an upheaval for the refugees, another hurdle remains. The IUCN and UNHCR have attempted to broker a deal between the governments of Bangladesh and Myanmar to find a way to let the animals cross. “Elephants are a non-politically sensitive issue, after all,” says Amin. But so far, they have been unsuccessful. The number of elephant deaths has plummeted from 13 between September 2017 and February 2018 to just one in the past year, even though the number of times elephants attempted to enter the camp has remained high. This is thanks to the aptly named elephant tusk force – “pun intended”, says Chris Melzer of UNHCR. 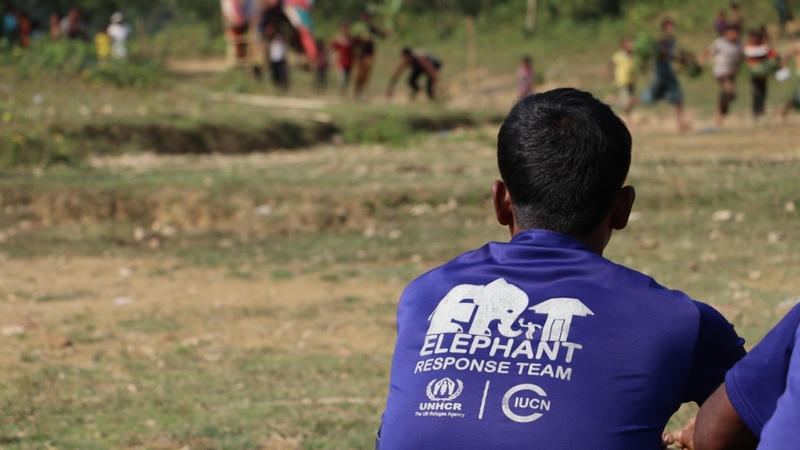 Comprising a passionate group of Rohingya refugees, the group is trained by UNHCR and IUCN to respond safely to elephants in the camp. “Their success is remarkable,” says Melzer. Watchtowers built throughout the camps are manned around the clock by two members of the tusk force. Equipped with torches and megaphones, these volunteers sound the alarm and alert the other members of their team if they spot an elephant. Instead of throwing sticks or confronting the animal aggressively, which might “antagonise the elephant”, the volunteers use lights and sounds to gently push the elephant back. Soon, tusk force members plan on introducing new flashing lights to do just this. Another element of the volunteers’ work is educating community members about elephants and what to do if one comes into the camp. One way is by staging a drill using a puppet elephant created for this purpose. The brightly coloured life-size puppet, steered by three puppeteers, charges into the camp from the nearby trees, accompanied by elephant sound effects. In the first run-through, the tusk force volunteers run around wildly, shouting and screaming and throwing objects, showing onlookers what not to do. In the second demonstration, they calmly form a line and slowly approach the elephant with their torches. “The puppet itself is a masterpiece,” says Melzer. 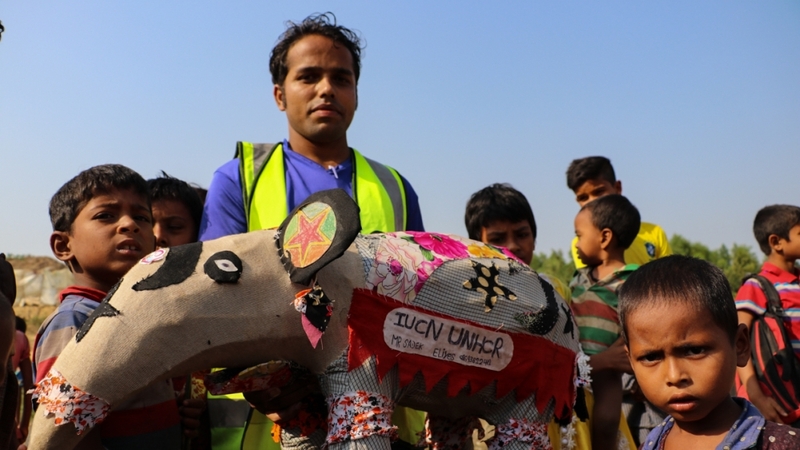 The whole community built the puppet, which was designed by Bangladeshi artist Kamruzzaman Shadhin. 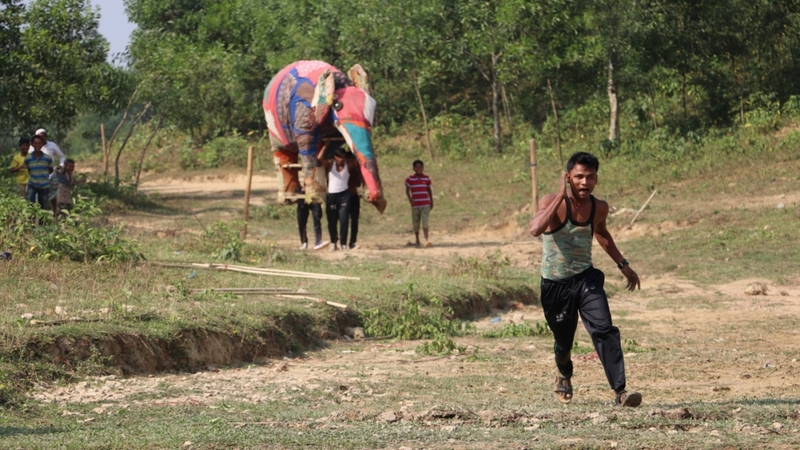 This helps connect the Rohingya – many of whom never encountered elephants in Myanmar – to the animals. The frame was made of bamboo and built by the men in the community. The women sewed their own used clothes to make a patchwork for the elephant’s skin. 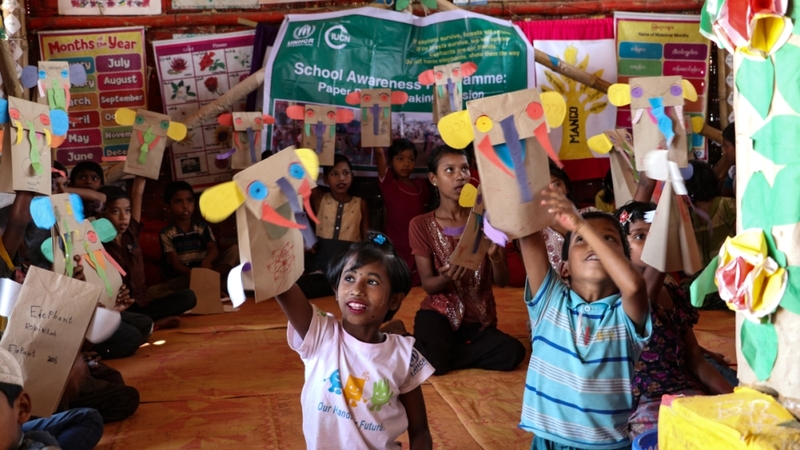 Rohingya children, too, are learning about their big-eared neighbours. “Elephants are our friends, don’t kill elephants, show them their way,” they sing at a learning centre as volunteers show them how to make elephant masks and teach them facts about the mammals. The message is coexistence, says tusk force leader Hossain. Like the rest of the group, he takes his work seriously.